This is the 124th edition of The Championships, as they are called. S Kalyana Ramanathan spends a day at London SW19 this week and finds that technology and romance coexist at this famous address. The 41m x 22m patch of perennial ryegrass glows in the midst of empty stands that can accommodate 15,000 spectators. The new retrac-table roof, which cost 80 million pounds, has been drawn back to let in the warmth of an English June morning, and there is a promise of something momentous, yet indefinable, in the air. I'm standing on the Centre Court at Wimbledon, which is silent and deserted except for a solitary guard. Somehow, it isn't hard to believe that a few days from now it will be transformed into an arena like none other. Outside, young volunteers in green overalls, armed with tiny chisels, are cleaning the crevices between flagstones on the pavements and driveways across 13.5 acres on the Church Road site. The ground staff run their mowers over the 17 Championship courts, manicuring the grass to a precise 8mm height. Gardeners trim and arrange the green Boston Ivy creepers and the carefully coordinated and planted white and purple flowers. On July 3 and 4, tennis fans in over 400 million homes across 180-odd countries will raise a toast to the new champions. But few would realise that what they witnessed during those two weeks was the crescendo to a symphony orchestrated by 120 full-time staff at the All England Lawn Tennis Club (AELTC), with the help of over 6,000 volunteers, including 260 ball boys and girls selected from local schools. Henry O'Grady, a volunteer at the Club's press office, and Johnny Perkins, The Championship's spokes-person, meet me at Gate No. 4. O'Grady, my guide for the day, runs a catering firm in Central London. The hat he wears this month is his annual sojourn at the club, when he volunteers at the press office. As we walk towards Court No. 2, we cross the Champagne Bar where some 20,000 bottles will be dispensed during the fortnight. At a landing dock opposite, strawberries from Kent, picked fresh every day, arrive at 5.30 every morning. 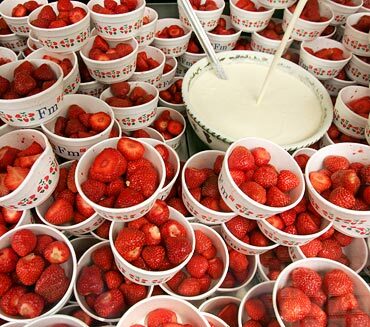 At the end of the fortnight, over 28,000 kg of strawberries, along with 7,000 litres of fresh cream, would have been consumed. Apart from a variety of snacks, fruits and the ubiquitous fish and chips, some 207,000 square meals would be served during The Championships. "It's mostly English food and French cuisine," says O'Grady, "with some Indian curries and Chinese food." A day before the sale of tickets starts, some 8,000 fans queue up outside the venue, most pitching their tents at a nearby park. Approximately 500 tickets for Centre Court reserved seats are available each day at the turnstiles except for the last four days. At Wimbledon, there is no special price for a ring-side seat. This is probably the only sporting event where some percentage of the tickets are sold from a till before the game. Wherever your seat is, it will set you back by the same 100 pounds or so. At the south end of Centre Court is the Royal Box, 12 feet above ground level, distinctive by its 74 dark green Lloyd Loom wicker chairs. These are the only seats that are not for sale on Centre Court. They are reserved for members of the royal family and other dignitaries. including well known sportsmen. Sachin Tendulkar and Amitabh Bachchan have been among the many personalities spotted here. The Queen is expected to attend this year's finals after a gap of nearly 33 years. 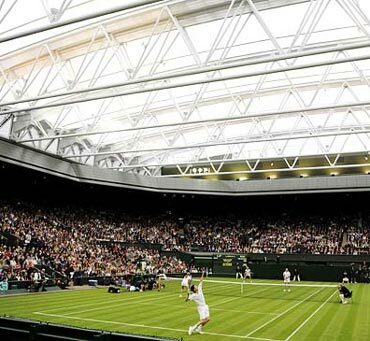 Last year, Centre Court got its famous retractable roof. At a height of 16 metre and weighing 3,000 tonne, it was commissioned at a cost of 80 million pounds. 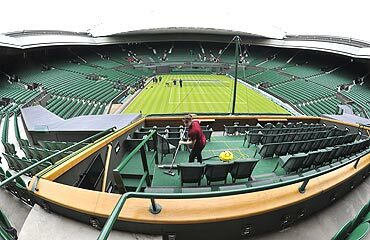 To get an idea of its span, imagine 7,500 open Wimbledon umbrellas -- that's what it would take to cover the same area as the roof does. Despite its weight and spread it takes just about 10 minutes to cover or open, moving at an average speed of 2 centimetre a second. 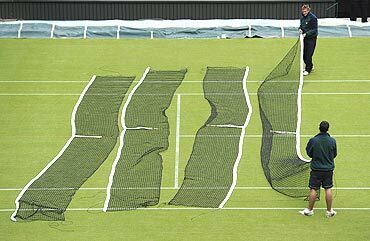 Wimbledon has historically stayed above the curve in terms of technology. Nine vendors led by IT major IBM provide the backend support for The Championships. Wimbledon went online in 1995 and registered 12.3 million unique users during the 2009 Championships. Today the website boasts 359 million page views so far, with an average time of 82 minutes spent by each user. BBC will be the host broadcaster as it has been since 1937. How much money does the club make? Ticket sales, corporate sponsors and banner ads, deals with official suppliers and sale of broadcast rights must all add up to a tidy sum. Johnny Perkins, the 15-year veteran in the press office, isn't exactly going to bare it all, but he tells me that the All England Lawn Tennis Ground Plc, which is the body that owns the facilities, received a small loan from the Lawn Tennis Association (the mother body that promotes the sport in UK) in the late 19th century. For this the LTA receives a certain percentage of surplus generated from Championship games. In 1879, the LTA received 116 pounds and in 2009, 29.17 million pounds as its share of the surplus from The Championships. As for the rest, I am told firmly, the Club's accounts are not subject to public scrutiny. The two-week Championships not only benefits the club and LTA but also a host of small and big businesses in Wimbledon. Robert Holmes, a leading estate agent in Wimbledon, says large properties are offered for short periods during the games. A single bed apartment goes for 500 pounds a week when the regular rent would be less than 200 pounds. Large properties that have a market value of 5 million pounds and can accommodate seven to eight people at once can fetch as much as 5,000 pounds a week. Around 500 such small and large properties are in the market during the fortnight, says Holmes. At the 200-year old local pub Dog & Fox you may not get "place even to stand during that fortnight" says bartender John Tomlin. On main match days, this pub apparently collects as much as it does in one whole week during the rest of the year. Venus Williams, Andy Roddick and local hero Andy Murray have all visited this pub. The 1,200-year old Anglican church in the vicinity, St Mary's, gets its biggest collection in the year during The Championships fortnight, says Fiona Grom, parish administrator. Last year, the church allowed fans to park their cars in its grounds and collected a cool 35,000 pounds far more than collections during festive seasons. 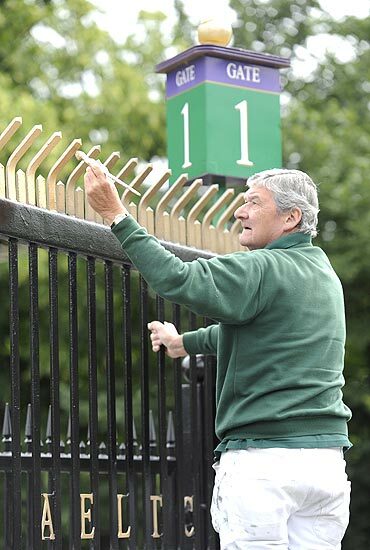 However there are members-only clubs like the 154-year old Wimbledon Village Club which says the games have little impact on their business. Manager John Taylor says his business comes from the 800-odd members who come there to socialise, read the paper and watch the games on Sky Sports, over a pint. Walking down the High Street, I see local businesses getting ready for some serious ringing at the cash register from June 21. Fresh coats of paint, refurbishments, special game-time offers. It's clearly festival time for the 65,000-odd local population. And on July 5, Wimbledon village will go back to being its sleepy self, stepping almost gladly away from the prying eyes of the world, only to re-emerge in the third week of June 2011 for yet another unmatched fortnight.